Orange County Plastic Surgery Patient's Incredible Transformation Inspires Her to Help Others by Publishing a Self-Help Book, Announces Cruise Plastic Surgery. A 35 year old patient of Dr. Joseph T. Cruise lost 235 pounds over a six and half year period leaving extreme amounts of excess skin and sagging. In an attempt to complete her weight loss journey, she had a tummy tuck and breast augmentation to improve her overall body appearance, which has resulted in a complete transformation inspiring her to publish a self-help book to help others successfully battle obesity and other issues. In an effort to help 35 year old Melissa Glossup reclaim her life following a life-long weight loss battle, Orange County plastic surgeon Dr. Joseph T. Cruise performed a tummy tuck and breast augmentation as part one of a two stage surgery plan. The result of her body transformation inspired her to complete a self-help book titled "From Plus-Size to Pin Up," (http://www.fromplussizetopinup.com/), which she had been working on for several years. "It took me almost seven years to realize the most important relationship I will ever have is with myself. This revelation allowed me to understand the need for self-respect, self-love, and self-efficacy. My book focuses on these necessary mindsets for achieving success in all areas of life, not just weight loss," explains Melissa. Melissa Glossup's story is one Orange County plastic surgeon Dr. Joseph Cruise hears all to often. Like most of his patients, Melissa struggled with childhood obesity, which developed over-time leading to a chronic health risk of morbid obesity. Her BMI reached 63 and her top weight was a staggering 375 pounds at just 5'5". 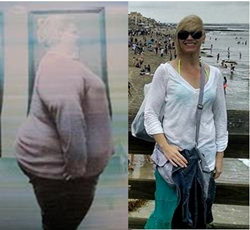 In 2008 Melissa began her weight loss journey, which required extensive surgery to re-route her intestines. She lost 85 pounds following surgery, and another 150 pounds with a focused mindset and change in her relationship with food. It took a total of six and half years to reach her goal weight. She was left with an incredible amount of excess skin hanging on her body, which was uncomfortable, difficult to manage with clothing, and kept her from doing things she wanted to do. When she decided to embark on her next journey of having plastic surgery to address the affects of such extreme weight loss, Melissa selected Orange County plastic surgeon, Dr. Joseph T. Cruise. Her total body transformation is being performed in two stages due to the amount of surgery needed. Melissa has completed stage one, which included a tummy tuck with breast augmentation. Dr. Cruise removed approximately twelve pounds of excess skin around her mid-section when performing the tummy tuck on Melissa. After her weight loss, Melissa recalls going from D cup breasts to having only loose sagging skin with almost no volume. Breast augmentation was performed to give Melissa back her sense of femininity and more latitude with clothing. Following her first set of procedures, Melissa states the only visible sign of her surgeries is a thin, pink line on her lower abdomen that hides nicely below even the smallest bikini bottom. Her breast incisions are not noticeable at all. Her waist once measured 62 inches and is now an incredible 28 inches. She went from a size 12 to size 4/6 and lost an additional 25 pounds. Just two weeks ago, Melissa wore a bikini to the pool for the first time in her life at 35 years of age. Melissa says she looks and feels like the woman she always saw in her mind's eye. The result of working towards completing her weight loss journey with Dr. Cruise has created a lasting mental, physical and emotional impact and has given her the motivation and courage to complete and publish her newly released self-help book titled "From Plus-Size to Pin-Up, Mindset Strategies to Transform Your Life" and open up to a nation about the battle she had with obesity since childhood. With obesity numbers nearing 40% in the United States, a good portion of the population will relate to her story and strategies for achieving weight loss success, along with other life's struggles. Melissa's next set of surgeries scheduled with Dr. Cruise will remove an estimated 10 to 15 pounds of excess skin on other areas of her body. After recovery, she plans to begin training for a half marathon, then marathons, and finally triathlons. This bucket list hasn't been obtainable until now, because of Melissa's obesity, and more recently the discomfort and limitations resulting from the excessive hanging skin on her body.